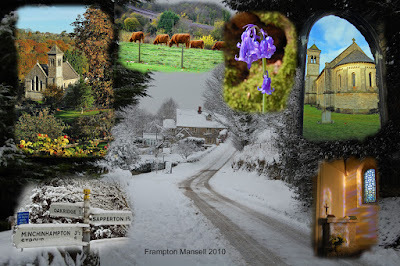 Welcome to the Frampton Mansell village web site. Frampton Mansell lies equidistant between Stroud and Cirencester in southern Gloucestershire. Situated on the edge of the Cotswolds, it is on the south side of the Frome Valley (also known as the Golden Valley) and has excellent views looking north. It has a church, village hall and pub together with the canal, river and railway which follow the valley down towards Stroud.